The dream turned to anguish and the worry turned to joy. 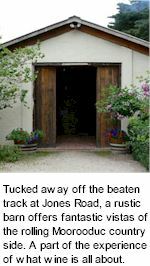 The journey of establishing Jones Road has been a trauma and a delight. Always with the same goal and focus on producing something fantastic. The rewards for many years in the business has brought knowledge, friendships, excitement and eternal optimism of one day producing wines with world wide recognition but more importantly self satisfaction that the wines are appreciated by many people. With every vintage the wines are improving and every vintage the knowledge and understanding of vineyards, terroir, winemaking techniques and requirement best suited to the grapes is increasing. The team are very happy with the way Jones Road wines are progressively attaining recognition and look forward to the next vintage. The future is looking very exciting at Jones Road. The maritime climate of this region produces some of Australia's best cool climate wines because of late ripening, fertile soil and careful vineyard management. Since those early days Jones Road have secured lease on 2 other vineyards on The Peninsula. One at the Port Phillip side, close to the water and the other at Balnarring near the Westernport Bay. This has increased the vines to 60 acres. With these extra parcels of fruit it gives the winemakers an opportunity to blend from the different sites, mixing different terroirs. The vineyard manager has gained recognition for his attention to detail and care of his vines. This has lead to other vineyards requesting his advice and operational skills. He is now caring for a further six properties on The Peninsula. Jones Road's varietals were carefully chosen to suit both the cool climate conditions and yet supply a good selection of premium wines. The Mornington Peninsula has developed a reputation for producing some outstanding Pinot Noir and Chardonnays whilst Pinot Gris and Grigio are gaining popularity. The vines are managed throughout the year with traditional skills, all being hand pruned and harvested. 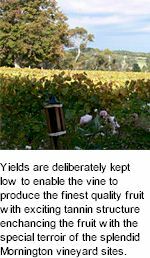 Yields are deliberately kept low to enable the vine to produce the finest quality fruit with exciting tannin structure enchancing the fruit with the special terroir of the fine vineyard sites. Winemaking at Jones Road starts in the vineyard. Careful management of yields and hand picking ensure the grapes reach the winery in premium condition. Vineyard owner, Rob Frewer, and son Matthew, vineyard manager have nurtured the vine since planting and always take a hands-on approach throughout the year especially at vintage when timing is critical for optimum baume, pH and acid levels. Wines are made at the Sticks Winery in nearby Yarra Valley by winemaker Travis Bush. Here they are given special traditional treatment whilst using the best handling methods combined with the latest technology. The wines are matured in the finest quality new French oak for at least ten months before being bottled and laid to rest until the flavours develop. The signature Jones Road style gently combines intense cool-climate fruit character with gentle winemaking complexity. The vines are cane pruned and bud numbers are carefully managed. A VSP trellis ensures an open canopy and careful leaf plucking allows the harvest of consistently ripe, healthy fruit. The winemaking approach is based on carefully enhancing the innate fruit character to make a fresh, complex and distinctive wine. A unique area of the Nepean Block was specifically targeted for a reserve quality wine. Vines were cane pruned to produce no more than 18 shoots per vine. Bunch thinning, to one per shoot is practiced to concentrate all available plant resources into the single bunch. Tucked away off the beaten track at Jones Road, a rustic barn offers fantastic vistas of the rolling Moorooduc countryside. Whether you choose to be inside or outside on the terrace, you can relax and soak up the great atmosphere and savour this little piece of paradise. Wine tasting at the converted piggery is not just about sampling wine. It is an experience. Sharing stories, learning about viticulture, vinification techniques, marketing and the Jones Road philosophy of what wine really is all about.